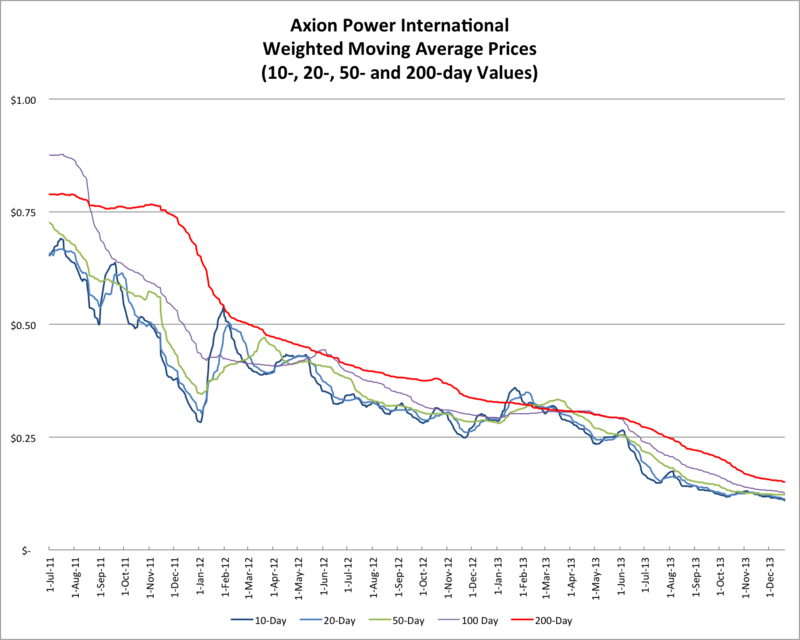 Mac325 posted a link to an Axion Power web site blog post on "Solar in the Caribbean". Iindelco posted a link to a slide show on some durable energy thinking in Curacao ny Michael Garvin. 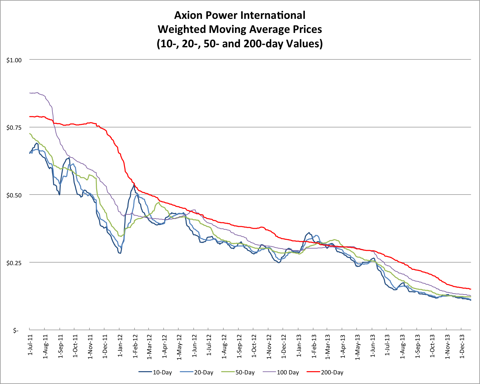 Updating The Impact Of Axion Power's PIPE by John Petersen. Q3 10-Q SEC filing is available. 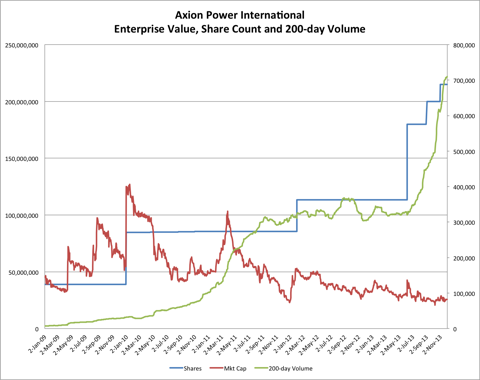 The PR release, Axion Power Reports Third Quarter Results For 2013, seems to have some additional color. 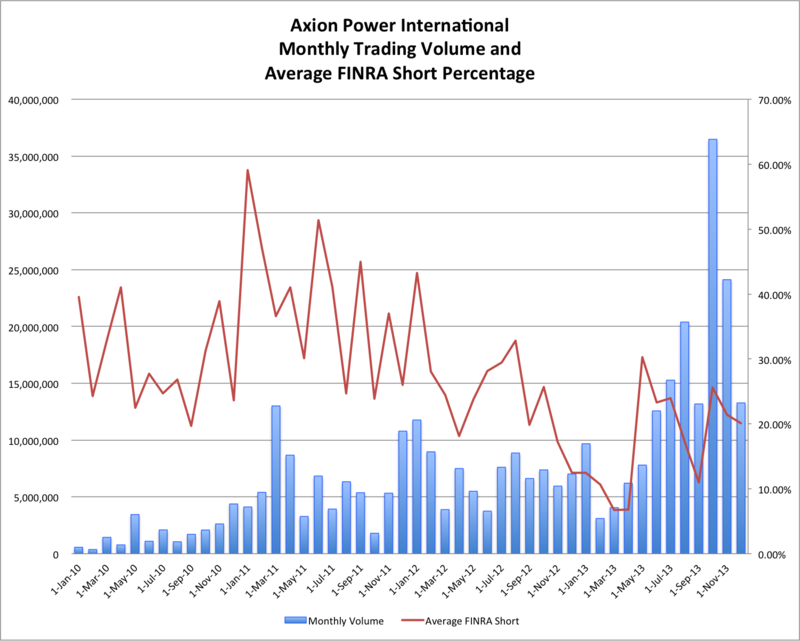 Seeking Alpha's Axion Power International's CEO Discusses Q3 2013 Results - Earnings Call Transcript will have some of the usual errors, but not to worry - the cadre of Axionistas has come through again! Pascquale put the Q3 '13 cc audio mp3 file in his drop box so you can review it at your leisure, even years from now! Kudos to him for that! Many thoughts, concerns, general comments, ... about all this were posted in a prior concentrator. If you are new to this equity, it might be worthwhile to peruse that concentrator. 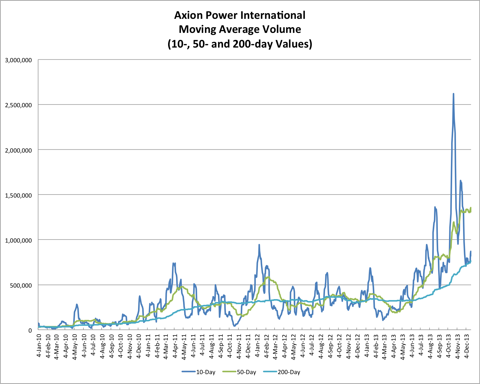 Axion Power Announces Sale Of PowerCube™ Energy Storage System: "... received a purchase order, ... for a PowerCube™ to be commissioned into a solar project. The Cube will provide storage for energy created by the solar panel system and also service the frequency regulation market ... expects to ship all equipment to the site in the current quarter of 2013, with installation to begin immediately". flyinglow, posted a comment saying Norfolk Southern is setting up classes for training in operation of all-electric locomotives. That started a thread of comments (well worth reading) by participants that led to flyinglow later saying it was in Atlanta. Subsequently Stefan Moroney posted a comment with a link to an article about NSC's training facility. Thanks to John Petersen for providing a three-page PDF with just an article on ePower and Axion extracted from the online edition of The Trucker. The purchase order is an extension of the existing agreement between Axion and ePower and further validates the performance of the PbC batteries in this hybrid application. At ePower's current specifications, each conversion kit System would require 56 PbC batteries and the PbC battery management system (NYSE:BMS). Axion values each truck conversion battery order at in excess of $20,000.00. Dr. Ed Buiel, Axion's CTO until the end of 2010 -- A link to an archive of his comments on yadoodle about the PbC battery and much more. Invaluable commentary! Thanks to 481086 for putting the list together. Axion Power PbC Batteries Continue To Demonstrate Effectiveness For Railroad Applications -- Axion completed shipping its high-performance PbC batteries to Norfolk Southern Corp. (NYSE:NSC), one of North America's leading transportation providers, for use in Norfolk Southern's first all electric locomotive - the NS-999. "ePower's Series Hybrid Electric Drive - Unmatched Fuel Economy for Heavy Trucks" -- by John Petersen. Discusses the potential fuel savings for ePower's Hybrid electric drive for class 8 trucks using Axion's PbC batteries. 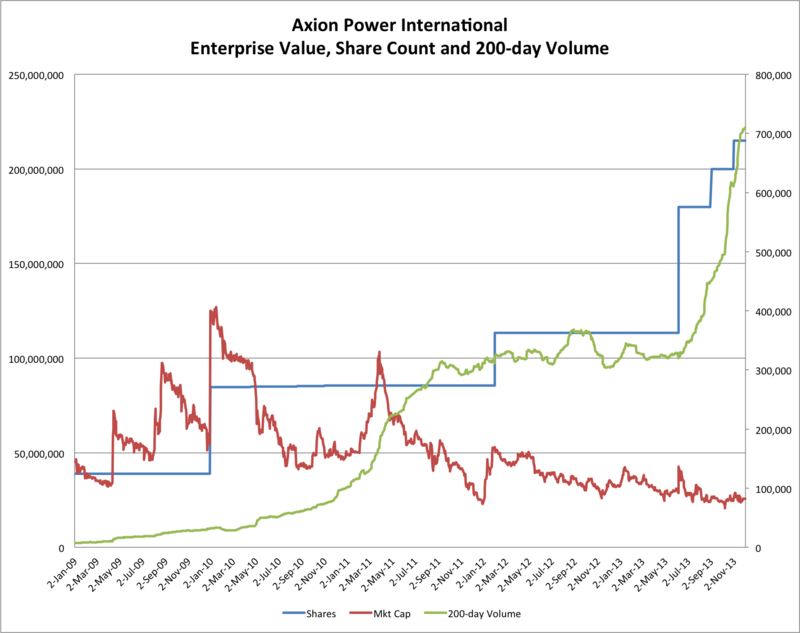 "Axion Power - A Battery Manufacturer Charging Forward" -- by John Petersen. 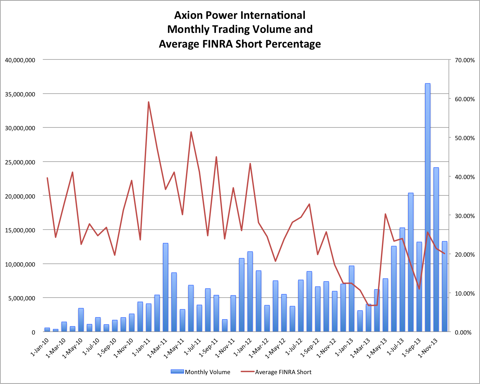 This is an excellent summation on Axion Power's history. It is a good starting point for introducing Axion Power to friends and family. 1. My 10-day average has turned up while the 20-day is flattening nicely. 2. Volume is sky high and we've traded more shares in October than we did in 2010. Unless the PIPErs have been keeping stock on the side for the last few months, there's a good chance that they'll run out within the next few days and give everybody a little breathing room. 3. The FINRA short values seem to be normalizing in the mid-30% range I'd expect with the PIPErs out there hammering stock into the market every day. The Axion Power Concentrator Web Sites, created by APC commentator Bangwhiz. 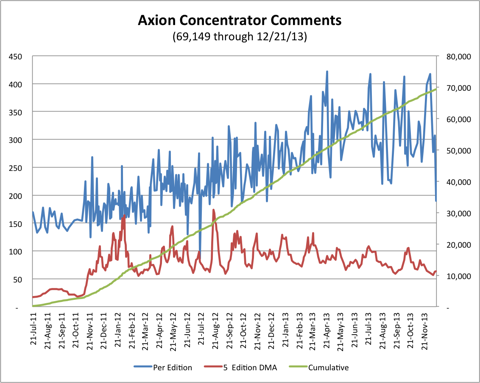 It is a complete easy-to-use online archive of all the information contained in the entire Axion Power Concentrator series from day one, including reports, articles, comments and posted links. Axion Power Wikispaces Web Site, created by APC commentator WDD. It is an excellent ongoing notebook aggregation of Axion Power facts. Axion Power Website. The first place any prospective investor should go and thoroughly explore with all SEC filings and investor presentations as well as past and present Press Releases. 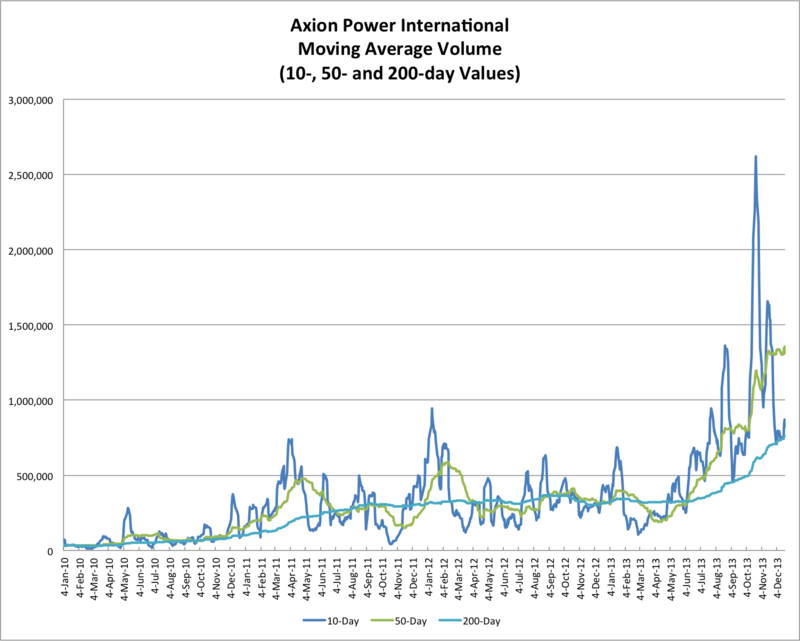 Axion Power Intra day Statistics Tracking: (new edition 12/1/2013) HTL tracks and charts AXPW's intra-day statistics. PbC Cost Estimating Spreadsheet and Instablog: Apmarshall62 put together an instablog for estimating costs of the PbC. It includes a downloadable spreadsheet that you can use to plug in your own cost estimations. Be sure and either follow the Axion Power Host ID on Seeking Alpha or click the check-box labeled "track new comments on this article" just ahead of the comments section! WARNING: This is a troll free zone. We reserve the right to eliminate posts, or posters that are disruptive. Disclosure: I am long AXPW.